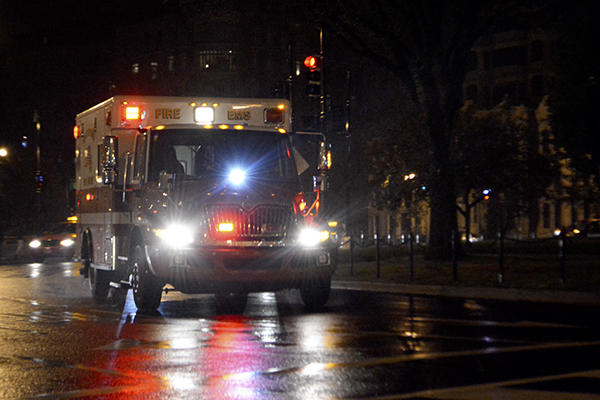 D.C. Mayor Muriel Bowser announced a plan last week to outsource low-priority emergency calls, freeing up city ambulances for more serious emergencies. Officials are looking to resuscitate a troubled emergency response system in the District. D.C. Mayor Muriel Bowser proposed emergency legislation Tuesday, which will outsource “low-priority” calls to private ambulances in an effort to match an increasing number of 911 calls, according to a press release from her office. The new plan, which was developed by D.C. Fire and EMS Chief Gregory Dean, will free up city ambulances for more serious calls, which will be transferred to higher-level trauma centers like GW Hospital, one of three trauma centers in the city. If the provision is passed, 911 operators will dispatch third-party ambulances for non-urgent calls like cold symptoms and sprained ankles. Bowser said the legislation is a temporary fix to an overburdened public system, which has been criticized for lagging response times and insufficient resources to reach life-threatening situations. A D.C. Fire and EMS responder, who spoke under the condition of anonymity because he is not authorized to speak with the media while on duty, said looking toward private companies will work as a short-term solution while the department gets back on track. He said the department needs time to gradually add more paramedics and ambulances, so in the meantime they need private contractors to fill that gap. He added that after a few months of training new EMTs and buying new ambulances, DCFD should be able to match the surge in calls. “It’s a catch-22. Even if we had all the money in the world, we’d still not be able to meet the amount of calls we’re getting now because of the hiring process and the time it takes to outfit enough ambulances to code and city specification,” the responder said. The number of 911 calls has increased 28 percent in the past four years, according to data from the mayor’s office. But the responder said because of the department’s ranking system, which categorizes medical emergency calls one through four, responders have ended up going to low-priority, level-three or level-four calls. “The problem is that we’re depleting resources on three and four calls, which is a waste of time,” he said. D.C. EMS has run into several circumstances in the past year where there weren’t enough resources to cover emergencies in the area, according to the Washington Post. In March, a stabbing victim waited almost half an hour for an ambulance. A week later, an injured D.C. police officer was driven to the emergency room by a colleague after his ambulance was canceled, and most recently, a toddler choking in Southeast D.C. who was transported to the hospital by a firetruck was pronounced dead at Children’s National Medical Center last month. GW’s EMeRG program has stepped up on behalf of Foggy Bottom’s emergency responders, integrating themselves into the city’s 911 response network with the purchase of a dispatch system two years ago. The student-run EMS team fields calls in the area as part of a mutual aid program. Austin Magnuson, the vice president for public relations at EMeRG, said the partnership can help city officials use their resources wisely and make sure patients are treated quickly. Still, he added that despite careful planning, there will be emergency situations that are more difficult based on timing and jurisdiction. “Cities go through very extensive planning in terms of placing resources. At the end of the day, you will have emergencies that are an inconvenience. Their goal is to cover any and all blind spots,” Magnuson said. Staff at GW Hospital did not return repeated requests for an interview. Though some details of Bowser’s new plan are unclear, a senior-ranking official in the John A. Wilson building who spoke on background because he is unable to speak in an official capacity, said there is a sense of urgency at the mayor’s office to get it passed as quickly as possible. “They told us this morning we need to get it passed ASAP,” he said last week. The official said Bowser will have to make a draft of her legislation public, naming which private companies she’s considering soon. He said the public can expect a copy of her legislation by Monday at the latest. “They’re trying to hold a vote for it on Tuesday, which means Bowser has a deadline to formally introduce her legislation before the vote,” the official said, meaning about a week turn-around from her announcement to the vote.